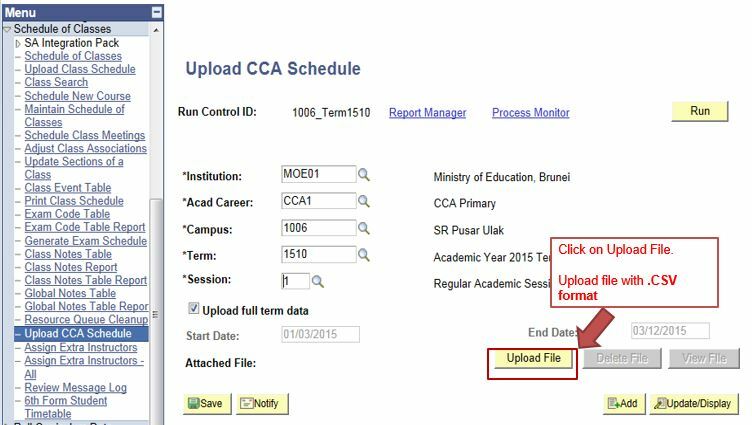 This function allows the users to upload CCA Schedule. 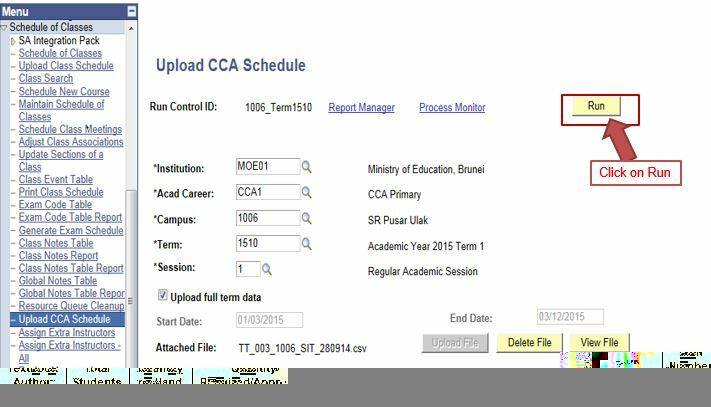 CCA Timetable are created using CCA Template: CCA Schedule Upload File - Sample.CSV.. 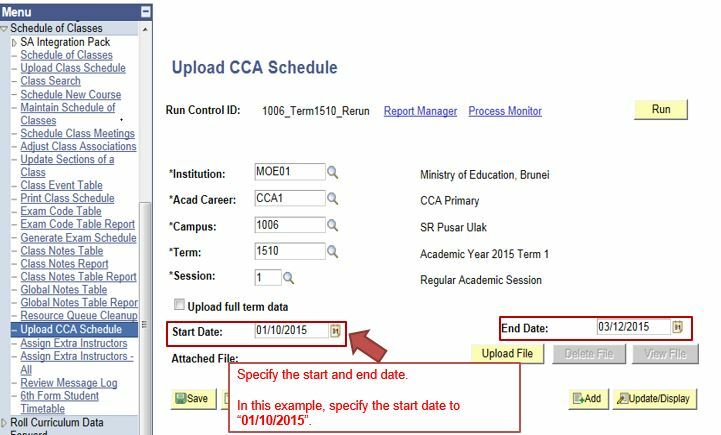 Detailed instructions can also be downloaded: CCA Schedule Instructions v0.5.pdf.. 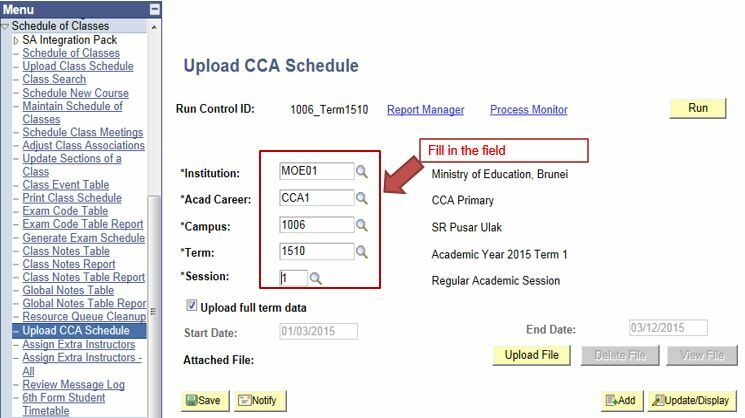 Fill in Run Control ID field and click Add button. 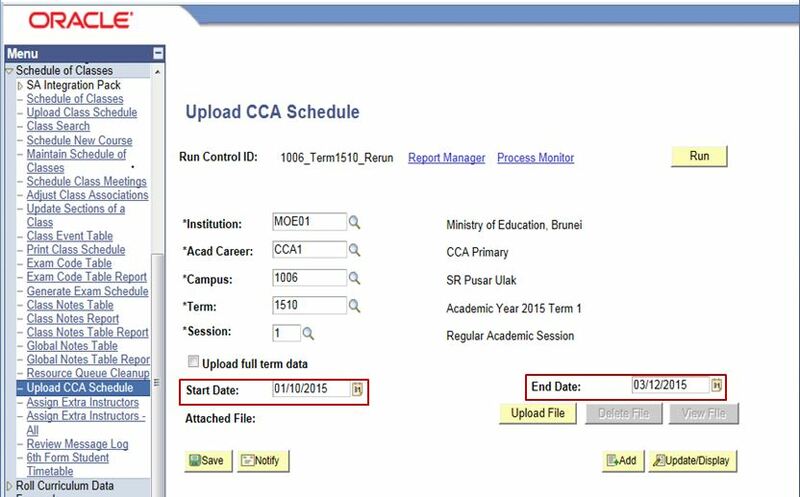 Format are as followed: (School Code)_Term (Term Code). E.g 1006_Term1510. 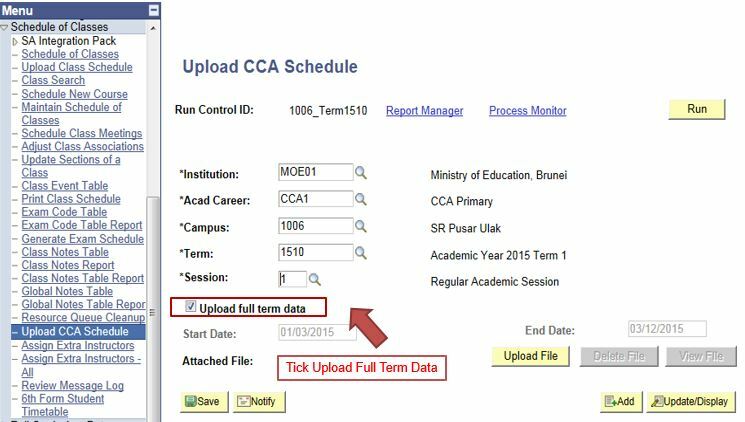 Acad career should be CCA related only. 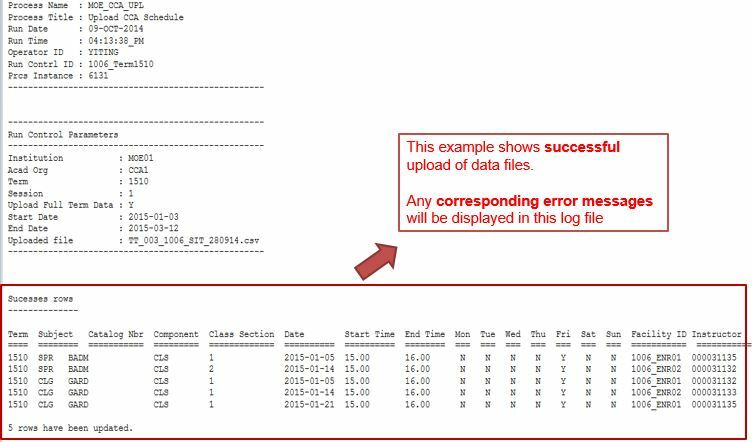 The upload data file should be filled in as shown in the image. 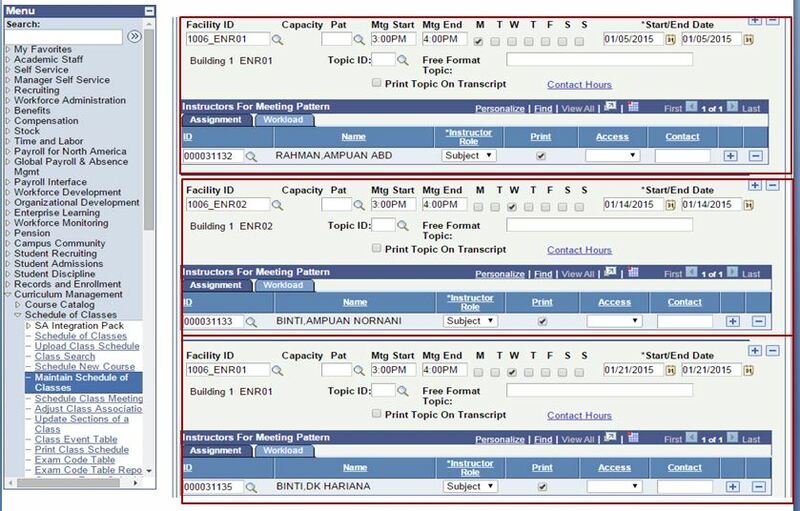 The data in each column should follow the below format. The column separator is semicolon ‘;’. Mon N If the activity is scheduled on this day of week, specify as ‘Y’; Otherwise specify ‘N’. Tue N If the activity is scheduled on this day of week, specify as ‘Y’; Otherwise specify ‘N’. Wed N If the activity is scheduled on this day of week, specify as ‘Y’; Otherwise specify ‘N’. Thu N If the activity is scheduled on this day of week, specify as ‘Y’; Otherwise specify ‘N’. Fri N If the activity is scheduled on this day of week, specify as ‘Y’; Otherwise specify ‘N’. 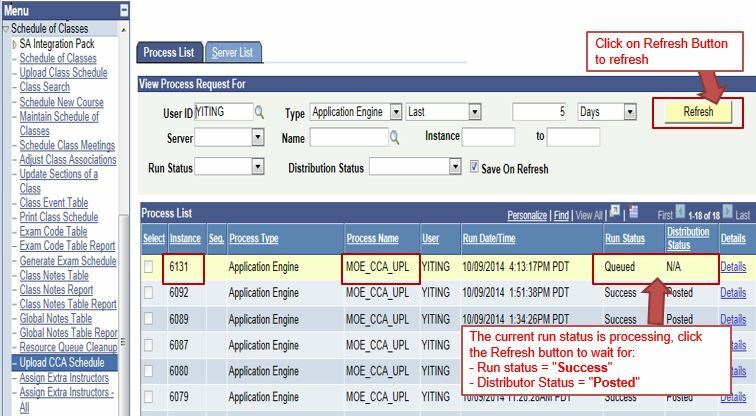 Sat Y If the activity is scheduled on this day of week, specify as ‘Y’; Otherwise specify ‘N’. Sun N If the activity is scheduled on this day of week, specify as ‘Y’; Otherwise specify ‘N’. A Message will pop out to prompt for user confirmation. Click OK button. 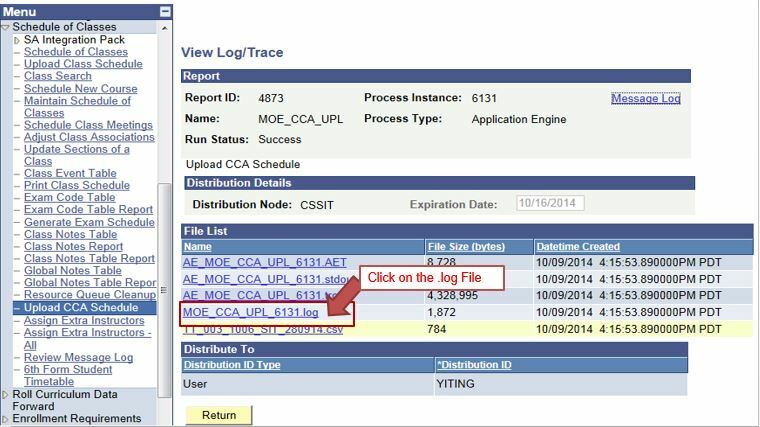 Click View Log/Trace link to display any corresponding error messages if the process fails. 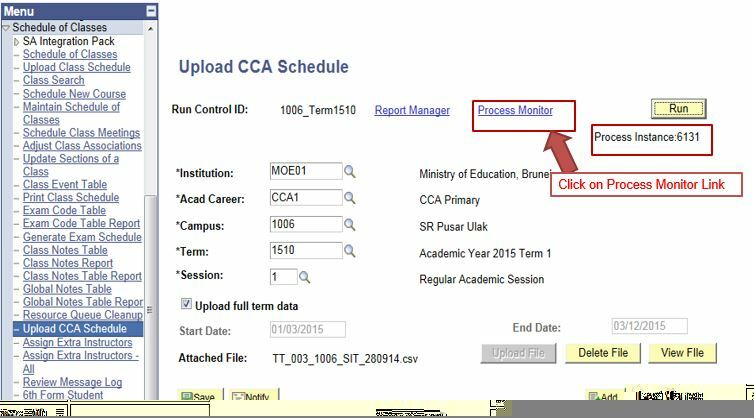 This process should be run only when major change is needed in CCA schedule. 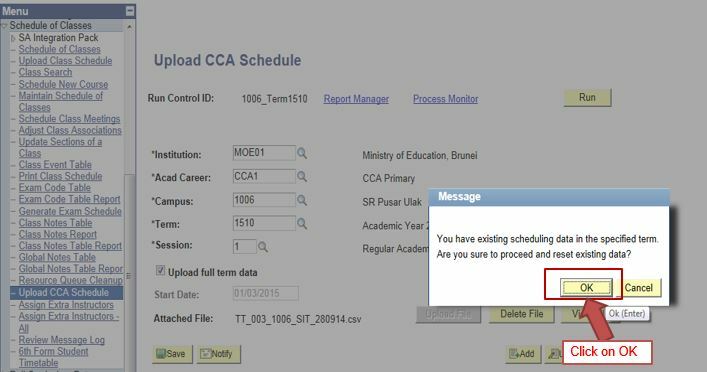 Otherwise please execute the steps in ‘Update CCA schedule’. 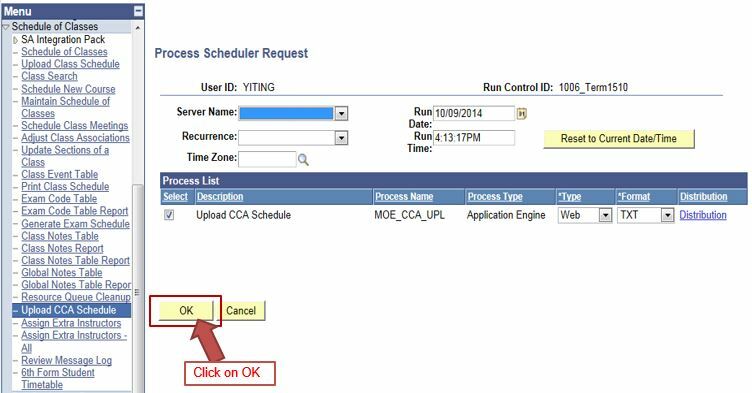 Fill in Run Control ID field and click Add button . 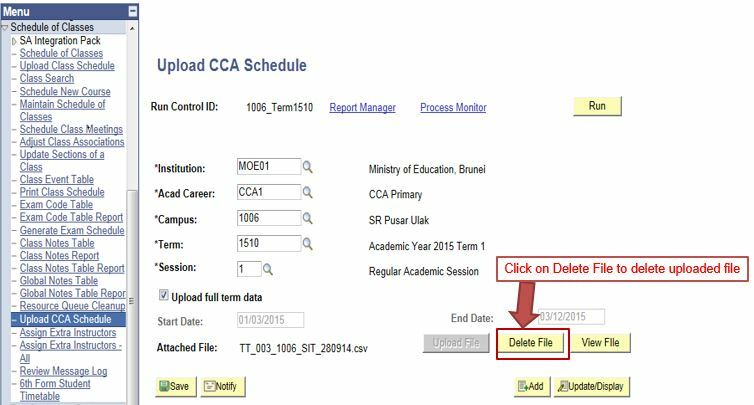 Format are as followed: (School Code)_Term (Term Code)_Rerun. E.g 1006_Term1510_Rerun. 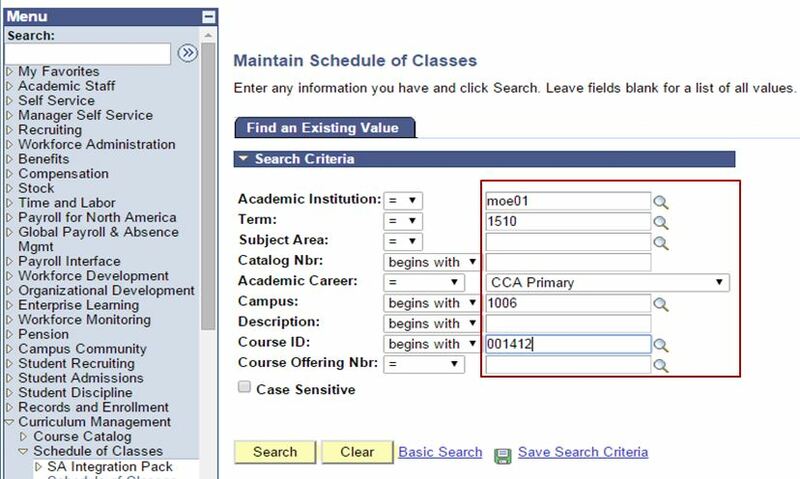 In the Find an Existing Value tab, enter the values in the Term, Subject Area and Campus fields. 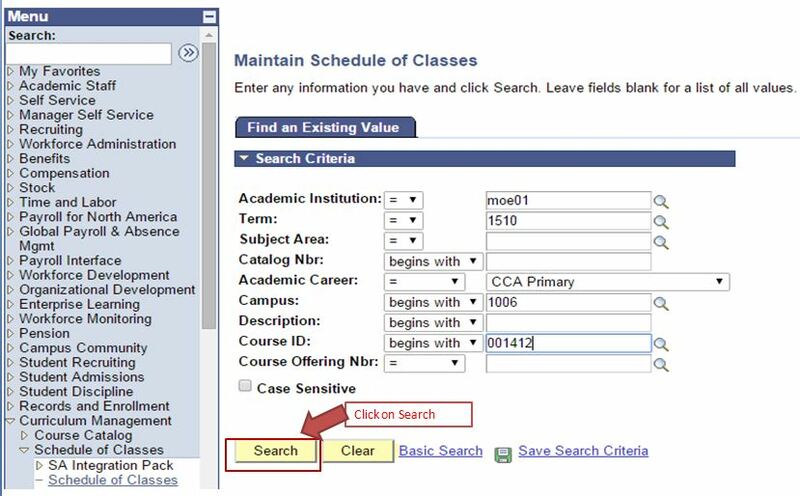 Click on the Search button to obtain the result based on the values you entered. 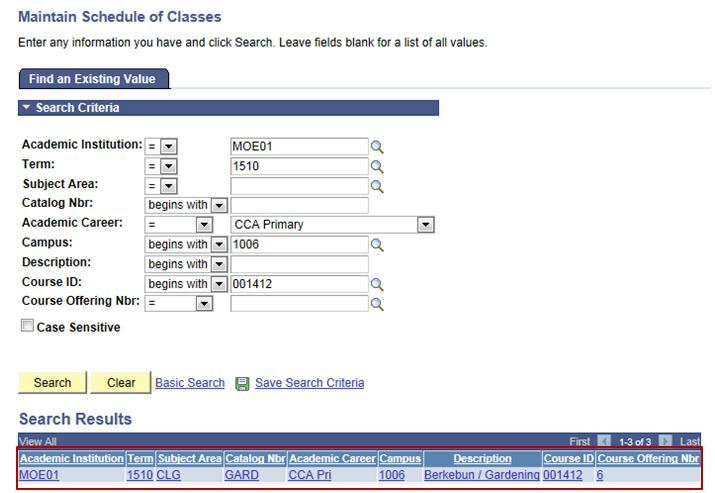 Click on one class in search results. 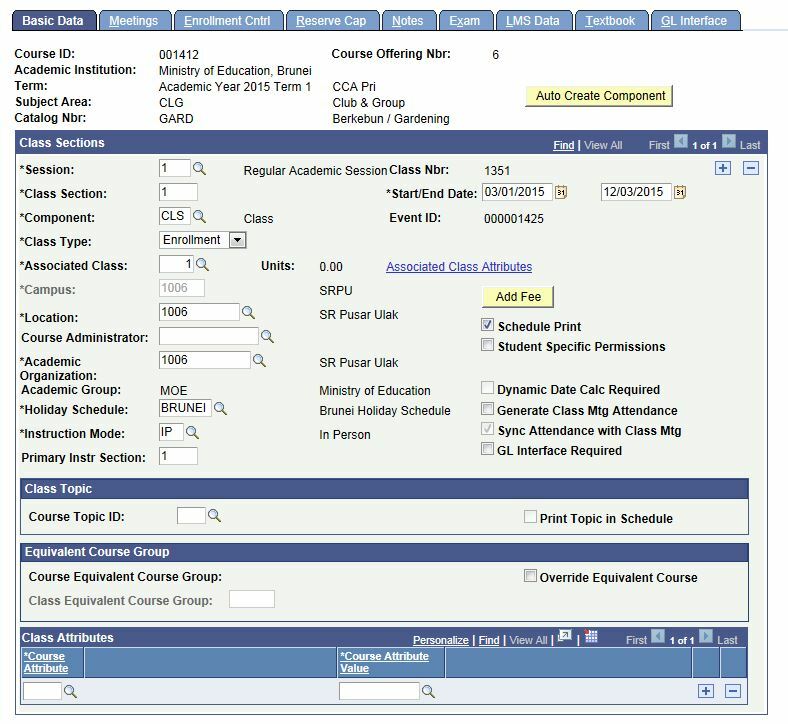 In the Basic Data page, you can verify if the class section matches class code in the school timetable file. 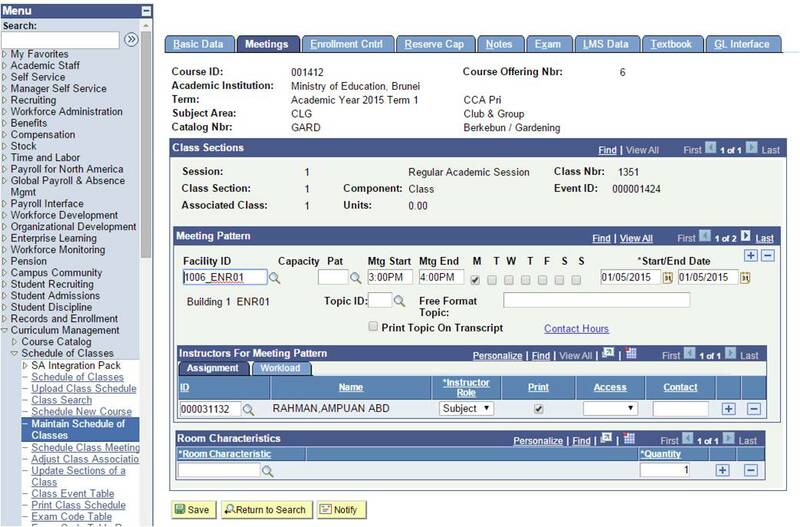 In the Meetings tab, under the Meeting Pattern section, verify if Facility ID, Mtg Start, Mtg End and Start/End Date and instructors matches school timetable file. 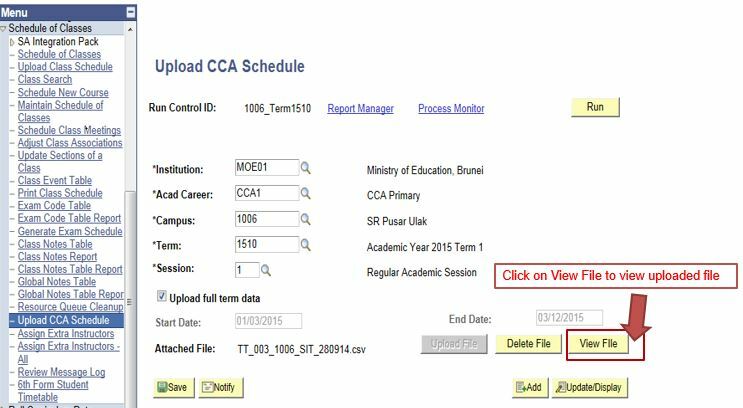 You may click on ‘View All’ if there is more than one row under the same code in school timetable file. You can see all meeting patterns. 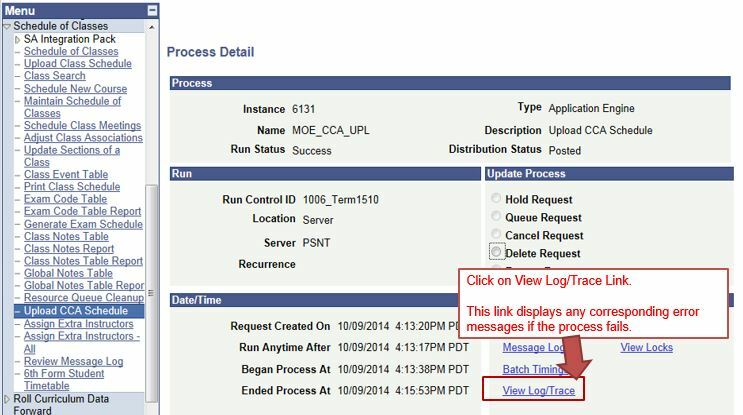 For reupload case, all existing meeting patterns within reupload date range will be deleted, and replaced by the meeting patterns in the reupload file. 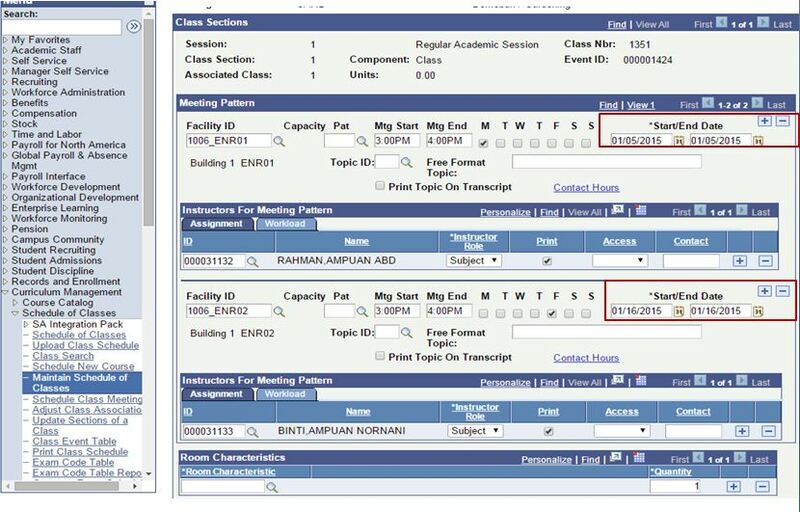 Falling between reupload date range 10/01/2015 and 12/03/2015, the existing class meeting patterns on 14/01/2015 and 21/01/2015 are deleted. 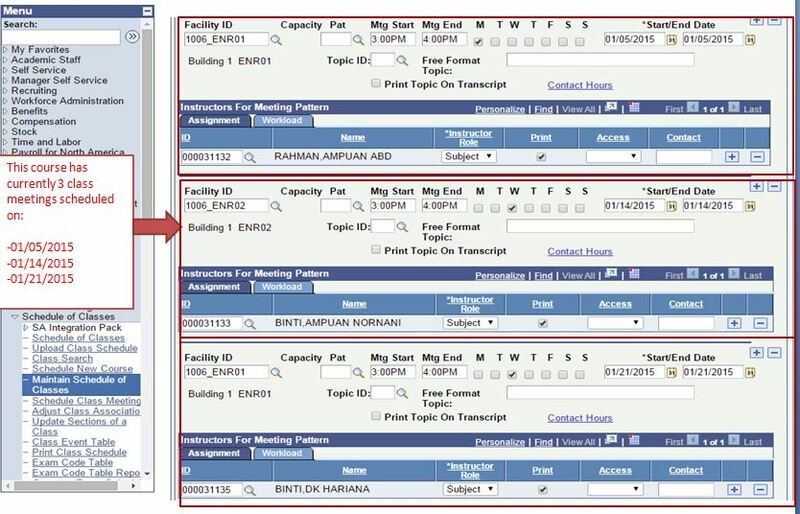 Reupload meeting pattern on 16/01/2015 is inserted. Falling outside reupload date range, the existing meeting on 05/01/2015 still remains after reupload. 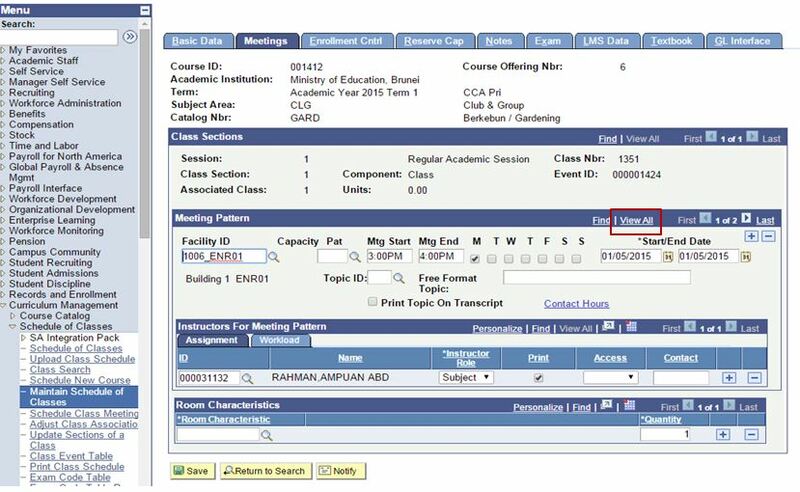 For the case where reupload class schedule with same or longer date range, all existing class meeting pattern will be replaced.